Antique Russian Icon *Birth of the Blessed Mother* dated ca. 1800. 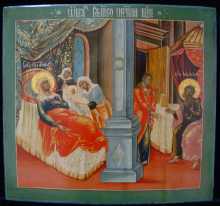 Superb antique Icon depicting the *Birth of the Blessed Mother*. Iconography and sources for this icon type are the Apocrypha of the Birth of the Blessed Mother, the First Gospel of James chapter V,2 ff. and the Pseudo Gospel of Matthew. The motive of the painting *Birth of the Blessed Mother* representing festive series of the Iconostasis of the Russian Orthodox Church. Excellent Russian painting tradition dated c1800. This Icon was painted in a workshop in Central Russia. Hand painted with egg tempera and elaborately gilt. Painting and gold on gesso on wood panel. A true masterpiece of art. Museum-Quality. This antique Icon sells with an Expert's report * Certificate of Authenticity. The Icon measuring 13.9" x 12.9" (35.5 cm x 33 cm). In view of the high age in good condition with traces of ageing. An old crack in the wood panel restored. Some retouches. 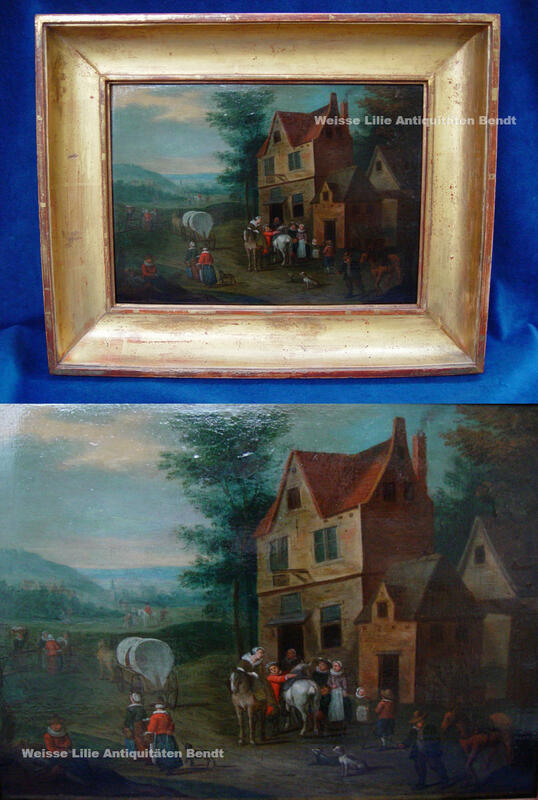 Antique oil painting "Landscape" dated the 18th century. Superb very fine oil painting Landscape with figures, horse, flock of sheep, town and very fine details. 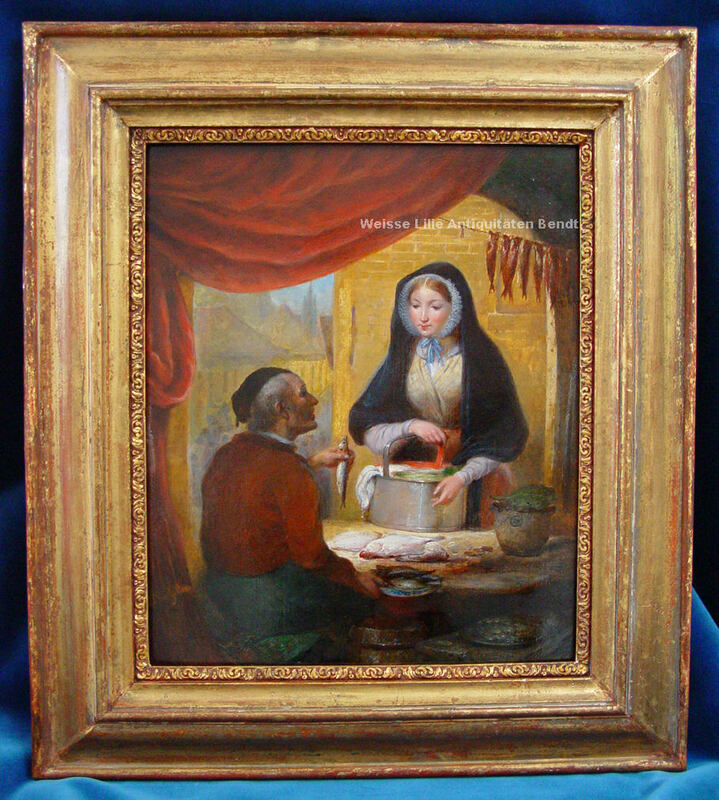 Excellent antique oil painting ! Antique painting, oil on wood panel. A true masterpiece of art. 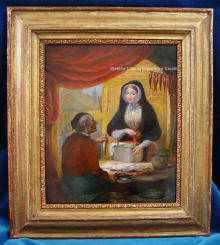 This antique painting sells with an Expert's report / Certificate of Authenticity. Antique frame dated about 1900, elaborately gilt wood in good condition with few traces of ageing. Ca. size: painting 27 x 19.5 cm (10.8" x 7.8"). Antique frame 37.4 x 30.4 cm (14.9" x 12.1"). Unsigned painting oil on wood panel. Only few old retouches, hardly to be seen. In view of the high age in good condition with few traces of ageing. No damages. Important Dutch painter, born June 11th, 1812 in Amsterdam, died in Vorden July 4th, 1874. Student of Pieter Gerardus van Os and Cornelis Steffellaar, co-workers of Pieter Caspar Christian, Cornelis Jan Bolt and Cornelis Springer. Worked at the Hague, Doorn, Amsterdam and Haarlem. He was member of the academy of Amsterdam and received the price Félix Meritis 1831 and 1832. He especially painted horses and village- subjects. "The Rest", oil on canvas, signed left below. 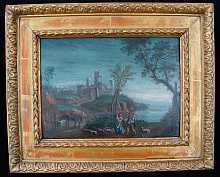 Original gilt frame. Ca. size: antique painting 66 cm x 51.5 cm, (26 x 20.3 inch), frame 86 cm x 72 cm, (34 x 28.3 inch). after a painting by Giovanni Francesco Babieri, known as GUERCINO (1591-1666), Italy. This rare antique painting is more than 200 years old. Antique frame dated the 19th century. Condition of the painting: oil on canvas. In view of the high age in very good condition, professionally cleaned. No damages. 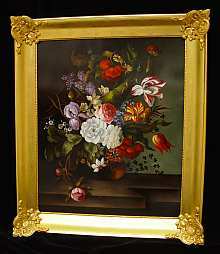 Condition of the antique frame: gilt solid wood. In view of the high age in very good condition, no damages. Ca. max. size: painting 45.7 x 34.5 cm. Frame 62 x 51 cm. "The Visitation of Mary", antique Baroque painting dated the 18th century, Germany. Verso the tensioning frame at top signed JG (ligated) and Bergmüller. Possibly the famous Baroque artist Johann Georg Bergmüller (Türkheim 1688-1762 Augsburg). Lit.Thieme/Becker. 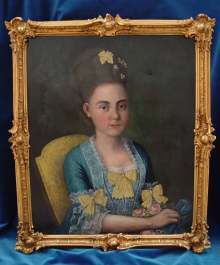 Antique painting dated the 18th century. A true masterpiece of art. Framed painting, oil on canvas. Antique frame dated the 19th century, elaborately gilt wood. Condition: in view of the high age in good, cleaned condition, relined a long time ago. No damages. Ca. max. size: painting 61 cm x 49 cm. Frame 69 x 57 cm. FLEMISH OLD-MASTER, dated the 17th century. "Animated Landscape with inn", oil painting on oak-wood panel. Unknown Old Flemish Master, excellent painting. RARE. Antique frame dated about 1780-1800. Condition, painting: in view of the high age in very good condition with traces of ageing, due to age and drying some craquelure and warping. No damages. Condition, frame: elaborate gilt wood, in view of the high age in good condition with few traces of ageing. No damages. Ca. max. size: painting 31.5 x 23.1 cm. Frame 43 x 34.5 cm. Pieter van Laer (Haarlem ca.1599 - ca.1642 Haarlem), relating to the artist. The Netherlands. 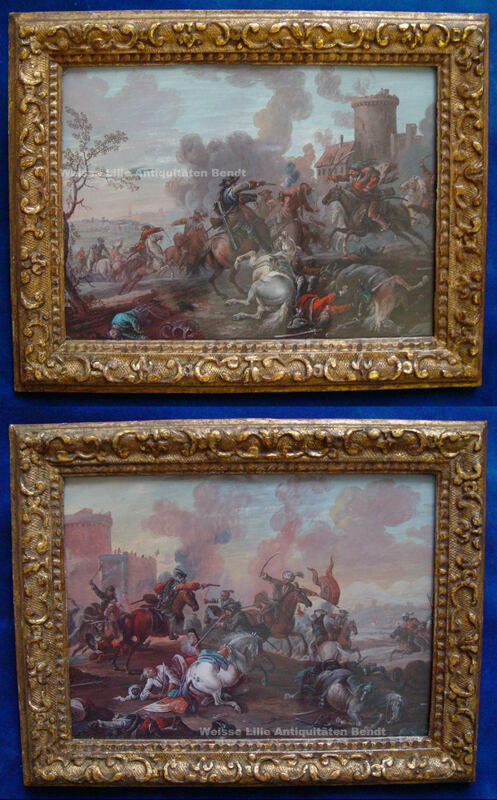 "Battle before a City", pair of Gouache Paintings, dated about 1690-1700 A.D.
A true masterpiece of art, 2 antique Paintings, Gouache on paper, framed in antique Berain Frames under glass. In view of the high age in very good and original condition. Antique Berain frames, dated about 1700, elaborate gilt wood, in view of the high age in good condition with few traces of ageing, no damages. Ca. max. size: one painting 21.5 x 16 cm. One Frame 26.8 x 21 cm. 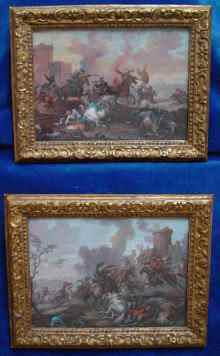 *Ernestine Amalie Bouginé*, antique Baroque painting dated the 18th century, Germany. Portrait verso described. Ernestine Amalie Bouginé, born March-16th-1780. Possibly a German painter from the famous family of artists Tischbein. Lit.Thieme/Becker. 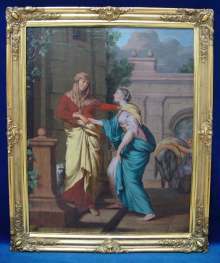 Antique painting dated the 18th century, oil on canvas. A true masterpiece of art ! Condition, painting: in view of the high age in good, cleaned condition. A long time ago relined. No damages. Framed painting. Antique frame dated the 19th century, gilt wood, frame in good condition. Ca. max. size: painting 71 cm x 58.3 cm. Frame 83 x 70.3 cm. 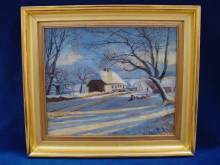 *Winter-Landscape*, antique painting dated the 19th century. Possibly circle of Eilif Peterssen (1852-1928) Norway. 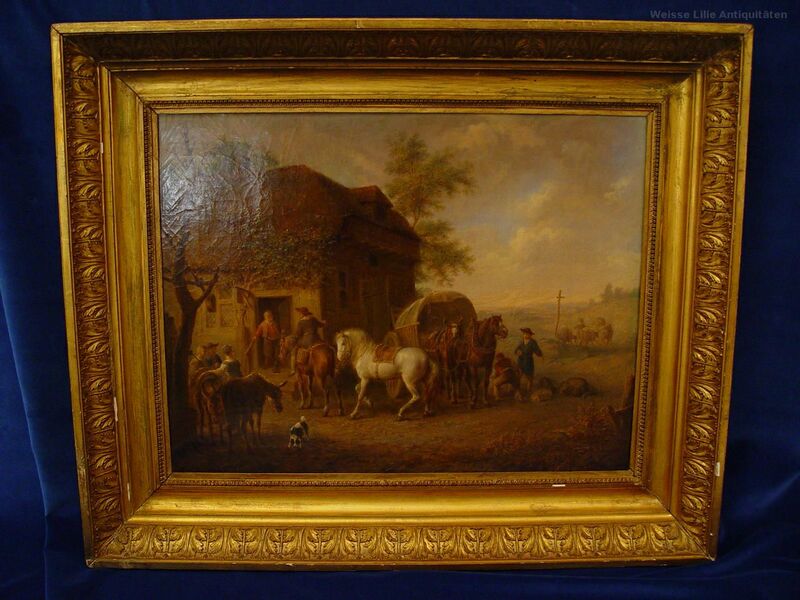 Antique painting dated the 19th century, oil on canvas, signed. Signature not identified. Framed painting. Condition, painting: in view of the high age in good condition. No damages. Antique frame dated about 1910, elaborately gilt wood in good condition. Ca. max. size painting: height 41.2 cm x 49 cm. Frame 52.7 x 60.5 cm. Eycken, Jean Baptiste van, 1809-1853. "At the Fishmonger / Fishdealer". 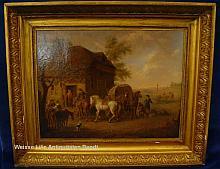 Painting dated about 1840, signed (ligated) JB van Eycken. Oil on wood panel, in view of the high age in good condition. Antique frame, dated about 1840. Gilt wood, in view of the high age in good condition. Ca. max. measurements: painting 31.5 cm x 26.3 cm, (12.4 x 10.4 inch), frame 43 cm x 38 cm, (16.9 x 15 inch). 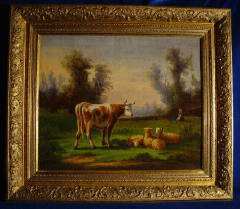 Summer landscape with cow, 19th century. Unknown Master, French school. Oil on canvas. Splendid gilt frame 19th century. Ca. size: painting 64.5 cm x 54 cm, (25.4 x 21.3 inch), frame 89.5 cm x 78 cm, (35.2 x 30.7 inch). In addition you may find more antique paintings when you click on the logo. The following print-objects are sold, however you might find interesting information. Willem SCHELLINKS (1623 - Amsterdam - 1678), Netherlands. 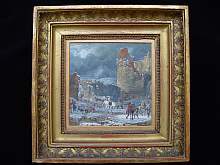 Winter Landscape dated the 17th century, with horsemen in uniforms, figures, castle ruin, dog, donkey, billy goat, and very fine details. Superb antique gouache painting original by Willem Schellinks, signed W.Schellinks pinxit. Very fine gouache painting on handwork laid paper. Verso collector stamp with anchor and old manuscript. Amazing painting by Willem Schellinks, masterfully painted. A true masterpiece of art. Museum quality ! 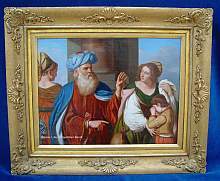 This antique painting is professionally framed under glass and passe-partout. Antique Empire frame dated about 1810, elaborately gilt wood. Condition, painting and frame: in view of the high age in very good condition with few traces of ageing. No damages. Ca. size: painting 15 x 14.7 cm. Empire frame 26.3 x 26.2 cm. Hermann BEHMER (Merzien 1831 - Weimar 1915), Germany. Original painting by Hermann BEHMER. 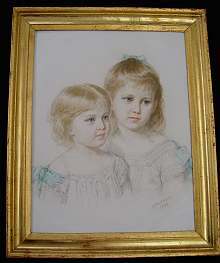 *Portrait of SISTERS*, signed and dated 1878. Signed and dated 1878 by the artist Hermann Behmer. Superb painting, chalk and pastel on heavy paperboard. Hermann BEHMER a well-known listed German artist, famous German painter of portraits and historical genres. Literature: Thieme/Becker. In 1876 he received a Medal at the Centennial Exhibition Philadelphia, PA. Antique pastel painting professionally framed under glass, antique gilt frame dated about 1870. Condition: antique painting, in view of the high age in excellent condition with few traces of ageing. No damages. 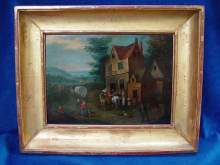 Antique frame, in view of the high age in good condition. Elaborately gilt wood, sideways painted. No damages. Ca. size: pastel painting 14" x 11.44". (35 x 28.6 cm). Frame 17" x 13.8" (42.5 x 34.5 cm). Heracles with Omphale. Precious miniature, original 18th century, Italy. 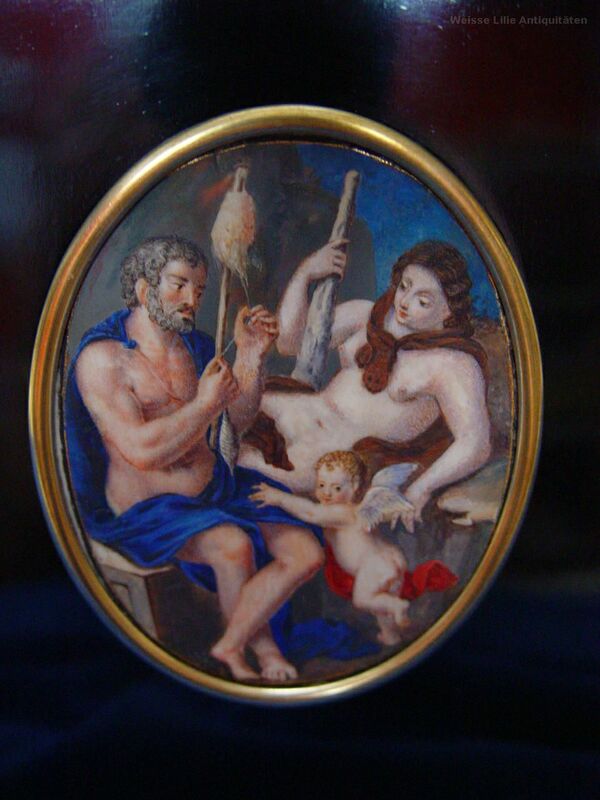 Together with cupido, painted en face on an ivory panel. Gouache / Tempera with rest of gildings. Rear side of the oval ivory panel decorated with filigran ornaments and with genuine rubies cabochon. Ebonised frame, original of the 19th century, French handpolish. Framed under glass. Oskar Robert DOGARTH (1898 Vienna - 1961 Vienna), Austria. Oil on copper plate, signed right side below: O.R.Dogarth. A true masterpiece of art. Antique frame dated about 1900, wood, elaborately gilt. 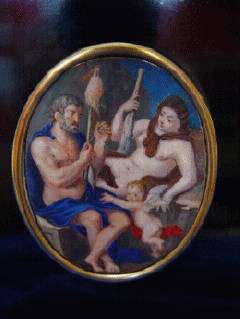 Condition of the painting: oil on copper plate. In view of the high age in good condition, professionally cleaned. No damages. Condition of the antique frame: solid wood elaborately gilt. In view of the high age in good condition, no damages. Ca. size: painting 60.2 x 50.4 cm. Antique frame 72 x 61.5 cm.